The home to Colorado Springs Olympic Training Center and 20 Olympic governing bodies, a vast outdoor paradise studded with celebrated natural landmarks, an 1870s resort town turned bustling metropolis — Colorado Springs is no average destination. 1. At an elevation of 6,035 feet, Colorado Springs has two-thirds of the oxygen found at sea level and the summit of 14,115-foot Pikes Peak has only half. Reach the summit of Pikes Peak - America’s Mountain by car, foot or bike — but be sure to give your body a few days to adapt to the higher altitude before heading up the mountain. 2. 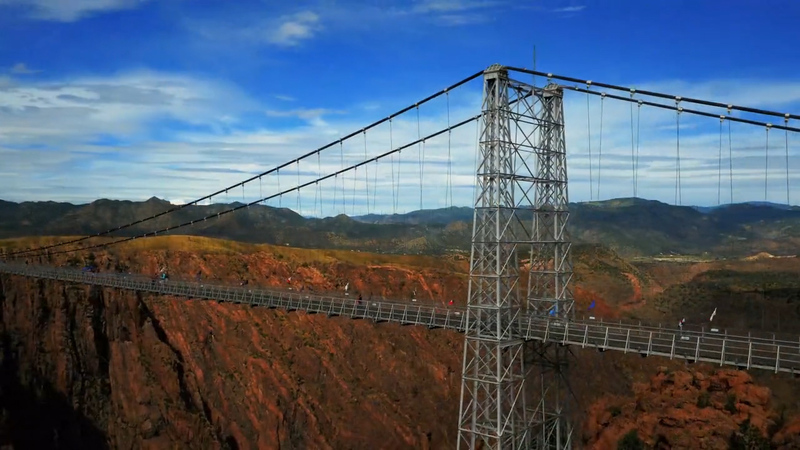 Built in 1929, the Royal Gorge Bridge is the highest suspension bridge in North America at 956 feet above the roaring Arkansas River. The impressive structure held the title of world’s highest until China’s Beipan River Guanxing Highway Bridge was completed in 2003. Be awed by the gorge’s grandeur by riding a gondola across or soaring on the zip line over the gorge for the ultimate adrenaline rush. 3. Downtown Colorado Springs’ north-south streets are named after mountain ranges, and the east-west streets are named after rivers. Stroll the walkable, lively streets to discover delicious eateries and live entertainment, and admire outdoor sculpture installations from the city’s Art on the Streets program. 4. Modeled after resort towns in Europe, Colorado Springs gained the nickname “Little London” when it was established in 1871. Travelers still journey from near and far for the area’s beauty and natural attractions and to indulge in pampering experiences at luxe properties like The Broadmoor and Cheyenne Mountain Resort. 5. The Manitou Incline was originally built for cable cars to carry materials to build pipelines. 6. Old Colorado City was the first city built in El Paso County and was Colorado’s first capital. Explore the historic district — now home to over 100 artists and crafters — or plan your trip around annual events that pay homage to its history, like Territory Days each Memorial Day weekend. 7. Garden of the Gods Park's famous red-rock formations were created millions of years ago during a geological upheaval along a natural fault line, and there's archaeological evidence that prehistoric people roamed the area in the 1300s B.C. Spot notable formations like Kissing Camels and Balanced Rock at the free city park, where you can also check out an interactive Visitor & Nature Center and partake in outdoor pursuits like hiking, biking and rock climbing. The natural wonder is ranked as the No. 1 park in the U.S. by TripAdvisor users. 8. The Pikes Peak International Hill Climb held its first race in 1916 on Pikes Peak, making it the second-oldest auto race in the U.S. after the Indianapolis 500. Watch top drivers from around the world test their skills up the 156 twists and turns of the mountainside every June.